On Wednesday, prosecutors in the Aaron Hernandez case announced that they would not fight the defense’s request to suppress evidence of four boxes of .45-caliber ammunition allegedly found by detectives in an apartment rented by Aaron Hernandez, or evidence of a loaded magazine for a .45-caliber Glock pistol allegedly found by detectives in a Hummer registered to Aaron Hernandez. In agreeing to not oppose the motion, Prosecutors also asked that Judge E. Susan Garsh seal the defense motion itself, arguing that it contained a reference to a polygraph test which determined that co-defendent, Carlos Ortiz, was not truthful when he denied shooting Odin Lloyd shortly after the shooting took place, and that “no legitimate purpose would be served by continuing to permit media access to [Hernandez’s] motion that references the results of Ortiz’s polygraph examination.” The judge rejected the request to seal the defense motion, according to court records. The announcement on Wednesday resolved the first of what is expected to be a flurry of defense motions to suppress evidence in the months preceding trial. Former Gator Football player, Aaron Hernandez, is scheduled to begin trial on January 9, 2015 for the 2013 murder of Odin Lloyd. Prosecutors have contended that Hernandez orchestrated the murder of Lloyd by having co-defendants, Ortiz and Ernest Wallace, Jr., meet Hernandez with Lloyd in a secluded field, and allegedly “gun down” Lloyd. 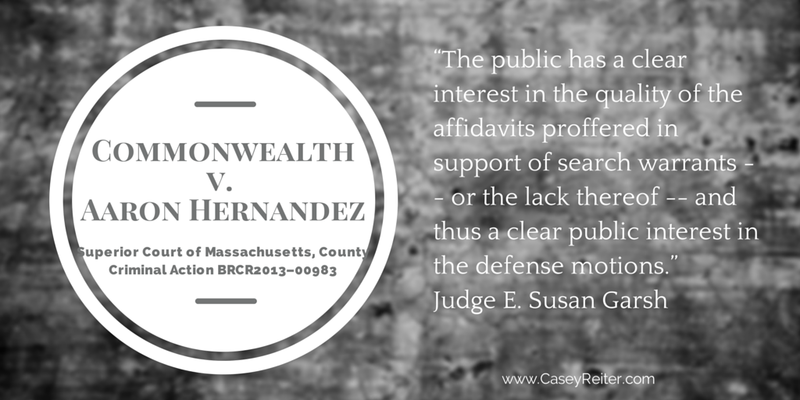 Hernandez has pleaded Not Guilty to the charges.